MAY 23 - Grupo Chegando Lá. june 27- Grupo Chegando Lá. july 16- Grupo Chegando Lá. August 3 - Francisco Marques in Portland! Oskar Blues HMLS. 6-9pm. Longmont, CO.
August 22- Grupo Chegando Lá. Some experience with percussion or other musical instruments required. Francisco Marques is a multi instrumentalist and singer who has been studying, teaching and performing Brazilian music in Colorado for 17 years. He regularly collaborates with out of state artists and educators for performances and workshops but spends a bulk of his time in Boulder and Denver playing Brazilian music with Ginga, Grupo Chegando Lá, Pagode na Pedra and Sambadendé. Born in São Paulo, Brazil and raised in the United States, he is a graduate from Colby College where he received a BA in Music. He is a dedicated musician and educator who is a regular part of the adjunct faculty at Naropa University in Boulder and has been teaching Samba/Pagode at California Brazil Camp for 6 years. Cultivated in Boulder, Colorado and comprised of some of the best jazz, classical and salsa musicians on the Front Range, Ginga is THE powerhouse Brazilian band in Colorado. They can bring an audience to a quiet purr with a sultry Bossa Nova or blow the roof off the evening with a full blown Carnaval style samba dance party. The seven principal members of the band are Francisco Marques (cavaquinho, bass, lead vocals), Greg LaLiberte (flute, saxophones, percussion, vocals), Victor Mestas (keyboards), Bill Kopper (acoustic 6 & 7 string guitars, electric guitar), Raoul Rossiter (drums, percussion, vocals), Carl Dixon (percussion, vocals), and Vincent Gonzalez (percussion, vocals). The current members of Sambadende are Chico Meira (Vocals, guitar, cavaquinho), Ty Hammes (timbal, congas, repenique, pandeiro), Nafisa Ramos (surdos, vocals, tantan), JJ Rademaekers (drum kit, percussion), Ian Brighton (sax, flute, vocals), and Francisco Marques (bass, vocals, percussion). 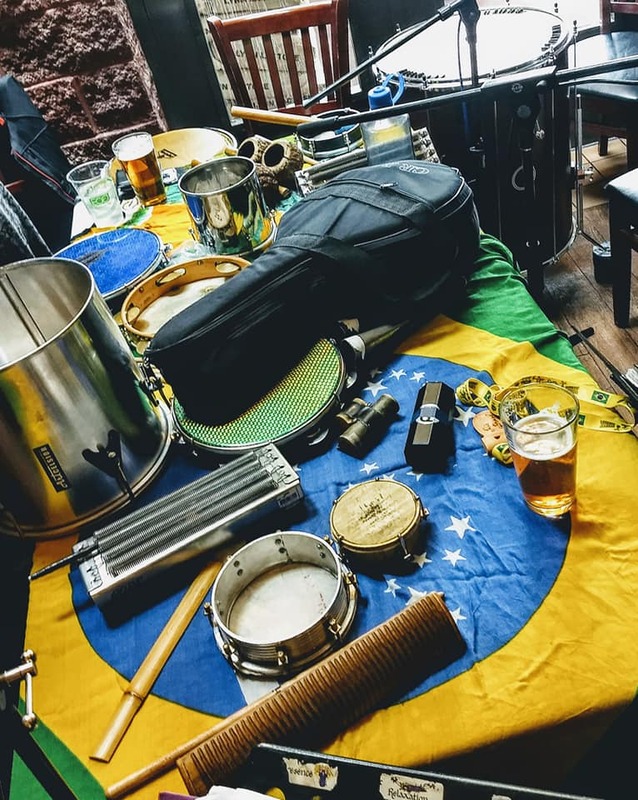 Based out of Boulder Colorado, Grupo Chegando Lá is an eclectic group of musicians who began as a study group, gathering weekly to play and study samba in the samba de mesa or pagode format. After years of study the group has become one of the main attractions at The Laughing Goat in Boulder. The students and Francisco convene there on the 4th Thursday of every month to bring as small taste of Brazil to the community.